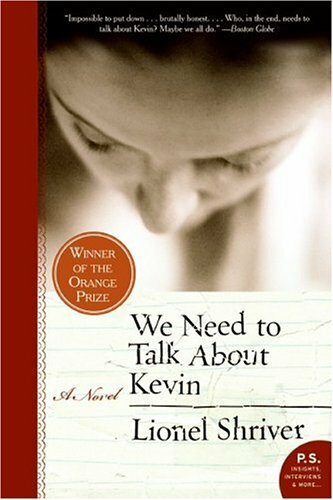 May 11, 2011 Booksbook review, Lionel Shriver, We Need to Talk About KevinReba R.
Anyhow, this book is told in first person by Eva, in letters written to her estranged husband, Franklin. She talks about her life before and after meeting Franklin (she is a successful owner of a travel guide business), her feelings about motherhood, and of course – about Kevin, their son. I’m not giving anything away to tell you that Kevin conducted a Columbine-style massacre at his high school, and Eva’s letters to Franklin are how she is coping with the aftermath. This is a pretty dark book… not many laughs, but rather some tears and even shock. Also, be forewarned that you might not like Eva very much… she is written to be a real person, with a real history, real quirks, real fears and real issues. If you’re one of those people who must LOVE your protagonist, this book may not be for you. But, I hope that if you’re one of those people, you will suspend those notions and open your heart to this book, because it is extremely well-written, thought provoking, and intensely jarring. After I finished this book, I saw on the Internet that it has been made into a film, which showed at Cannes this year, and was nominated for the Palme d’Or. There’s not yet a US release date set. I will definitely see this movie, though as always, it will be difficult for the actors to compete with the visions in my mind as I read Ms. Shriver’s words. I am not going to say here who is playing the roles of Eva and Franklin, as they are quite a departure from the faces I saw in my mind’s eye, and I don’t want to prevent you from building your own images of the characters. I will say that while the leads are both talented actors, they are not who I would have chosen for the roles (but do I ever like movie-from-book casting?? Just look at the U.S. Dragon Tattoo movies they’re doing… but that’s for another day!). My recommendation would be to read the book, then Google it like I did and check out the cast list on IMDB.com. I hope you’ll read this book! Available in paperback on Amazon.